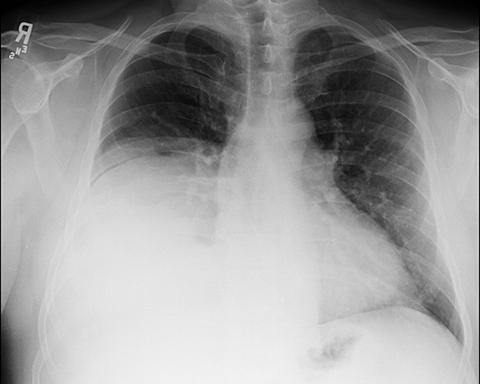 A 54-year-old man presented to the ER with chronic shortness of breath and wheezing. He had no significant medical or surgical history. The patient denied a history of tobacco use and asbestos exposure, and had no family history of lung cancer or pulmonary disease. On physical examination, he was afebrile with a normal cardiac exam. He had decreased breath sounds throughout the entire right hemithorax. All laboratory values were within normal limits. Initial PA and lateral chest X-rays demonstrated apparent elevation of the right hemidiaphragm (Figure 1). 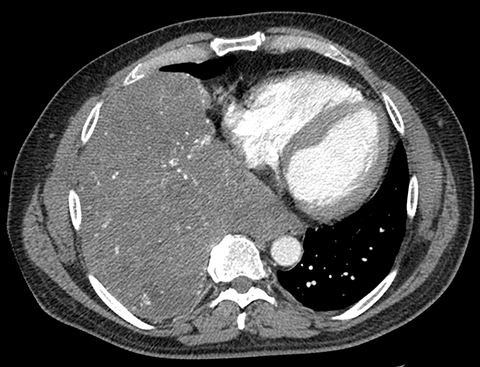 A subsequent contrast-enhanced CT scan of the chest demonstrated a heterogeneous, lobulated, hypervascular mass in the right lower hemithorax measuring approximately 18 x 18 x 16 cm (CC, AP, transverse). There was no apparent chest wall or mediastinal invasion and no associated pleural effusion or mediastinal adenopathy was seen. Also, there was no evidence of necrosis or calcification. The mass had a significant systemic arterial supply, primarily from the right inferior phrenic artery. Mass effect resulted in shift of the heart and mediastium to the left (Figures 2). 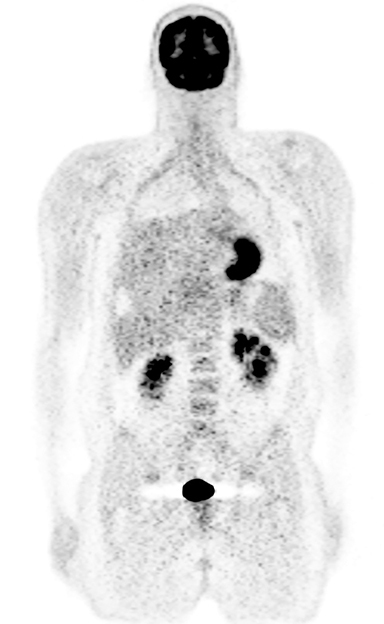 A follow up PET/CT scan demonstrated mild heterogeneous FDG activity within the mass with an SUV of 5.18. No FDG-avid mediastinal or hilar adenopathy was seen and there was no evidence of FDG avid metastasis. Also, there was no evidence of direct chest wall invasion (Figure 3). 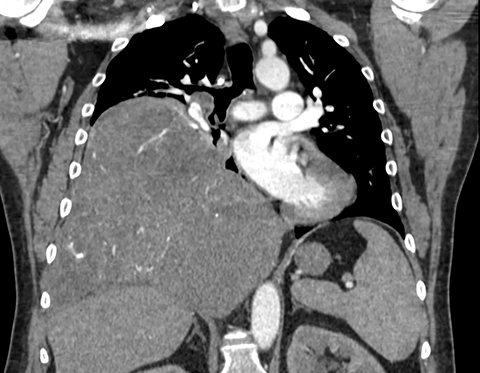 Subsequently, the patient underwent a CT-guided transthoracic biopsy followed by complete surgical resection. Giant solitary fibrous tumors of the pleura are part of a broad class of fibroblastic lesions that can occur nearly anywhere in the body. These relatively rare tumors are often asymptomatic, eventually presenting with symptoms related to mass effect on adjacent structures or occasionally from paraneoplastic phenomena. The imaging features are typical of benign lesions: well circumscribed, without necrosis or local invasion and often have a significant systemic blood supply. This case also highlighted the PET scan findings of mild FDG activity. They are rarely malignant and complete surgical resection is usually curative. Wagner E. Das tuberkelähnliche Lymphadenom (der cytogene oder reticulirte Tuberkel). Arch Heilk (Leipzig) 1870; 11:497. Okike N, Bernatz PE, Woolner LB. Localized mesothelioma of the pleura: benign and malignant variants. J Thorac Cardiovasc Surg 1978; 75:363–372. Suter M et al, Localized Fibrous Tumours of the Pleura: 15 New Cases and Review of the Literature. Eur J Cardiothorac Surg. 1998;14(5), 453-459. Rosado-de-Christenson ML, Abbott GF., Page McAdams H, et al. Solitary fibrous tumors of the pleura. Radiographics. 2003; 23:759–783. doi: 10.1148/rg.233025165. England DM, Hochholzer L, McCarthy MJ. Solitary benign and malignant fibrous tumors of the pleura. Am J Surg Pathol. 1989; 13:640–658. doi: 10.1097/00000478-198908000-00003. Galateau-Salle F, Churg A, Roggli V, Travis WD; World Health Organization Committee for Tumors of the Pleura The 2015 World Health Organization Classification of Tumors of the Pleura: Advances since the 2004 Classification. J Thorac Oncol. 2016 Feb;11(2):142-54. doi: 10.1016/j.jtho.2015.11.005. de Perrot M, Fischer S, Bründler MA, Sekine Y, Keshavjee S. Solitary fibrous tumors of the pleura. Ann Thorac Surg 2002; 74:285–293. Masson EA, Mac Farlane IA, Graham D, Foy P. Spontaneous hypo-glycemia due to a pleural fibroma: role of insulin-like growth factors. Thorax. 1991; 46:930–931. Juntang Guo, Xiangyang Chu, Yu-e Sun, et al. World J Surg. 2010 Nov; 34(11): 2553–2557.Published online 2010 Jul 14. doi: 10.1007/s00268-010-0715-x). Robinson LA, Reilly RB. Localized pleural mesothelioma. The clinical spectrum. Chest. 1994;106:1611–1615. Rego E, Solomon BA. Giant solitary fibrous tumor of the pleura. Appl Radiol. 2018;47(9):41-43. Prepared by Ms. Rego while a third-year pre-medical undergraduate at the University of Pennsylvania, Philadelphia, PA, and Dr. Solomon while Chairman of the Department of Radiology at Pottstown Memorial Medical Center, Pottstown, PA.